The National Trust is probably the best example for proving that British institutions don’t lack a sense of humor, quite the opposite. The National Trust has released ten silly walks guide, a collections of online guides that will tell you how to get to some of the places with the most embarrassing names in the UK. Not only will you discover some truly amazing places, but you will be saved from the embarrassment of asking passers-by for directions. So here are some of the places with funny names in the UK. It is a mystery how this place got its name, but what’s sure is that asking about it from some clueless local can definitely earn you a glare, or maybe even a punch. This three mile long walk will take you to some of the most amazing coastal areas in Cornwall, but it will take some effort. Most of the way is very steep, which is one possible explanation for the walk’s unusual name. 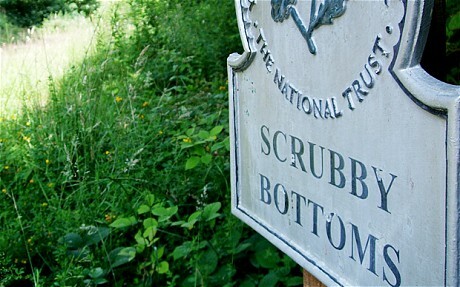 The National Trust hasn’t yet come up with a plausible explanation as to the origins of this name, but wild theories abound. The ware is a land for rough grazing, and the walk that takes you through it is rather impressive – the spectacular Jurassic Coast. The best time to take this walk is in the Spring, when the entire area is taken over by wildflowers. It is not the fault of this name, nor of its godfather/mother, that it sounds like modern slang. A booby is actually a seabird that is often seen diving in the water in stormy weather. The Booby’s Bay walk takes you to some of the most popular parts of the northern Cornwall coast, and it also gives you the chance to see some rare species of plants and maybe even animals, if you’re lucky. There is a very logical explanation of this place’s name (no, it wasn’t just named by a particularly rude local). Pisser supposedly comes from pissant, meaning insignificant, and clough is an old English word for a wooded vale. Insignificant vale doesn’t sound as good as Pisser Clough, you have to admit that. Scubby Bottoms got its name because it is located at the bottom of a valley, and it is filled with scrub, that is, shrubs. You can take a half a mile walk around the area, and you’ll get plenty of chances to see a variety of plant and wild-life, as well as some rather charming ridge lined with Monterey pines. Here you can find the National Trust’s free guides to some of the places with funny names in the UK.